This is one of the largest forests in Uganda, and forms a habitat for a number of primates and forest dwellers. Due to its location, Maramagambo also has a great diversity of butterflies and birds. The walk culminates in a visit to volcanic caves that are home to thousands of bats. Pythons are often observed in the crevices of the bats cave as they prey on bats. In this walk you will see the picturesque blue lake Kimeranjojo which got its name after swallowing an elephant. Other trails will lead you to the crater lake and habitats of the wild chimps and forest bird. In the afternoon you will have another game drive and during the dry season we will drive you to the Edward's Flats to see more elephants, large herds of buffalo and different waterbirds. Occasionally we might find in this area the shoebill stork and by surprise some hunting lions. 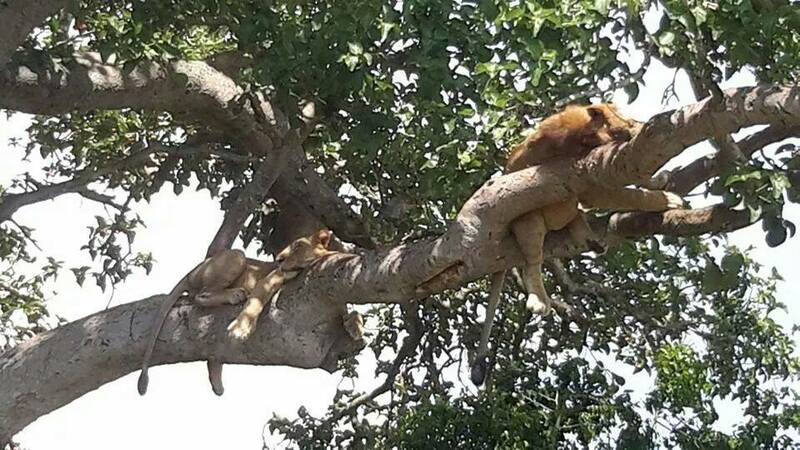 Seasons allowing, you will drive through the Ishasha sector in search for the tree-climbing lions. Nowhere in Africa do you stand a better chance of seeing this than in the large low limbed fig trees of Ishasha. This game drive en route will expose you to some of the animals that you might have missed seeing while on your game drives in Kasenyi and Queens Mile. Arrival in Bwindi is in the late afternoon. Once you are checked-in, you could rather be interested in rural African culture and we suggest you take a guided village walk in Buhoma Village - see how Ugandans live, visit a local bar and meet the local medicine man! Please speak to your guide about the various options. In the afternoon you can go on a game drive to Kazuma Look-out Point with a stunning view onto 9 of the lakes surrounding this park. On your way you will see most of the animal species occurring in Lake Mburo National Park. The walk onto Kazuma Look-out Point is steep but short and extremely rewording and should not be missed when visiting this park. Heading east from Lake Mburo, we bid farewell to the park’s friendly staff as we depart for Kampala.